My son had a balance bike for his second birthday and he used it for the next 2 years nearly every day. The most important consideration when buying a balance bikes is that the seat is low enough so that the child can rest their feet on the floor. Obviously the child will need to use their feet to push along on the floor so this is very important. Find below advice on buying a balance bike, wooden balance bikes, the best budget bike, our top choice and lots more. The Strider classic balance bike is for kids age 18 months old so it should be perfect for most 2 year olds.It’s lowest seat height is 11 inches (approx 28cm) but the seat and handlebars are fully adjustable up to 16.5 inches (approx 42cm). So your child should last with this bike up to 3 years.You can also buy an additional seat post so your child can use it up to 5 years old. Or consider the Strider sport featured below which comes with the seat post included. ​The Strider sport is almost the same as the classic but it also comes with an extension seat post and extra padded seat for the bike. This will extend the seat height up to 19 inches (48cm) so your child can use it for even longer (up to 5 years) meaning it's the only balance bike most kids will ever need. This is also a great option for taller kids as well.The Strider is more expensive but with the fully adjustable handlebars and seat it could last your child for years so is well worth the investment.​​The Strider has the lowest seat heigh setting of any of the bikes featured on this page so is a good option for the smallest of children. It also features EVA foam tyres which are puncture proof, it's super lightweight at just 2.9kg which means it's easy for 2 year olds to control and for their parents to pick up and carry when they've had enough. Not sure whether to go for the Strider classic or the Strider sport. Check out a comparison of the classic vs sport to help you decide. ✔️ Weight of Bike - Small children do better with lighter bikes as they are easier for them to control and manoeuvre. They need to be able to hold the weight of the bike so they can get on and off it easily. Ideally a balance bike should weigh no more than 1/3 of a child's weight. The Puky bike is perfect for 2 year old (recommended for kids sized from 85cm) and it comes highly recommend it. It features a low step through and platform so great for little legs getting on and off. ​The seat height ranges from 29cm to 40cm. Remember to get a child's inseam measurement (inside leg) to make sure that the seat can be set at the right height for your child. It has foam tyres so you don’t have to worry about punctures and they give a smooth ride across pavements and paths. It features a special learner bike saddle and safety handlebar grips. There are also footrests where little ones can rest their legs while they're gliding. If you're looking for a cheaper balance bike, another good option is the tiny bike. ✔️ Tyres - many balance bikes for very young children will have EVA Foam tyres. They are lighter than airfilled tyres so don't add to the weight of the bike. They are also puncture proof and don't need to be checked. Air filled tyres can be seen on some balance bikes especially those for older children as they offer more traction and cushioning. For taller children or for children aged 2 1/2 years it may be worth considering the Puky LR 1L bike. It's designed for kids from 90cm tall. The lowest saddle height is 34 to 45cm. The height adjustable handlebars range from 49cm - 57cm. The bike is much heavier than the LRM Puky bike featured above and the Strider models weighing in at 5kg. Lighter bikes are easier for young children to manage. It has pneumatic (air filled tyres). There are pros and cons of air filled tyres. They offer more traction on uneven surfaces and different terrain. They also offer more cushioning which can be helpful when going up and down kerbs. However, they do add weight to the bike so this bike will be better for a heavier, stronger child. ✔️ Brakes - most first balance bikes don't have brakes. Why? Very young children instinctively use their feet to stop like they do to move and don't have the co-ordination for a hand brake. So won't use a brake even if it is fitted. The bikestar has 10 inch wheels and a seat height of 30cm so is another perfect sized balance bike for kids age 2. The seat and handlebars do adjust. The seat adjusts from 30-37 cm and the handlebar height from approx. 43-49 cm. Therefore it won't last as long as the strider but this is reflected in a much lower price point. This bike has pneumatic tyres which always give a smoother ride. Like the other bikes featured, the seat and handlebars are adjustable. The reviews for this bike are excellent and there are reviews of kids as young as 18 months being able to use it. The Boppi No Pedal bike is the lowest price option featured on this page. It's aimed at kids from age 2 to 5 years old with a seat height range from 30cm to 40cm and a handlebar range from 52 to 62cm. The seat is padded for a bit of extra comfort. It has puncture proof EVA foam tyres so you don’t have to worry about maintenance and the bike gives a smooth ride across pavements and paths. It is very lightweight at 3.2kg. The tiny bike could be used indoors or outdoors. 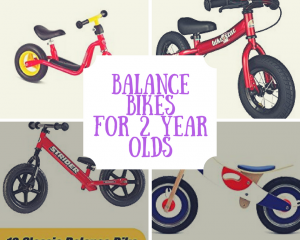 Wooden balance bikes are another option for 2 year olds. They tend to have a retro feel about them and look cool. Read more about the differences between wooden and metal balance bikes. Check out more options of wooden balance bikes. What to look for when buying a balance bike for a 2 Year Old? Lots of people buy balance bikes for their 2 year old but say they couldn’t use it because they were too young. However, quite often the reason they aren’t able to use the balance bike is because the balance bike is too big for them. The child’s feet need to be able to be flat on the ground when they are sitting on the seat of the balance bike. This is because they need to push their feet along the ground so they can scoot along. ​Lots of balance bike are designed for children aged 3 plus and these types of bikes are normally too big for most 2 year olds. So the first thing to make sure of is the balance bike is the right size for your child. How to make sure the balance bike is the right size? To make sure the balance bike is the right size for your child, you will need to measure their inseam. This is the length of their leg from the top of the crotch to the floor. The balance bike you will need should ideally measure about 1 inch less than their inseam so they can get on and off the bike easily as well as push it along. The smallest balance bikes for young children are around 11 inches (approx 28cm) from the ground to the saddle height. These are the best sized bikes you need to look at when you are buying for a 2 year old (unless your 2 year old is tall or heading towards 3). Another thing to consider when buying a balance bike for a 2 year old is the weight of the balance bike. A lighter balance bike will be easier for them to manoeuvre and control. It will also be easier for parents and carers to pick up and carry if they have enough of riding on their balance bike. If you have a balance bike which is heavy they will find it much more different to ride. Young children under 3 years of age don't use a brake when riding a balance bike. They will control a bike with their feet. They make it go with their feet and stop with their feet, so balance bikes for 2 year old children generally don't have a brake at all.